Email replies to blog comments are a great way to keep conversations going. When we comment on a blog, we seldom check back to see if we received any comment replies. Yet comment replies tend to encourage us to return to a blog. It’s nice knowing the blogger cares about our opinions. This is where Postmatic comes in. This WordPress plugin aim to keep the conversation going as an email commenting system. Commenters who would like to receive comment replies via email simply need to tick the check box beside “Participate in this conversation via e-mail” before submitting their comment. After that they’ll receive an email to which they must reply “agree” to confirm. This additional step is there as a safeguard against spam bots. Before Postmatic, I used a different comment reply plugin. It worked fine for a while but then one day all the comment reply emails started bouncing. Gmail marked them as spam. Yahoo wouldn’t even deliver them. Naturally, I started searching for solutions. It was perfect timing because just a couple of weeks before that, Postmatic launched their beta program. I tested several plugins but none of them worked the way I expected them to. That is how I came to try Postmatic. I figured a beta plugin couldn’t work any worse than the one that had failed me. Since Postmatic was still in beta, I seized the opportunity to send in my feedback and make feature requests. The developers were very helpful and approachable, always looking for ways to fix my problems. They were also very receptive to everyone’s ideas, regularly asking for input from all the beta testers. That’s why I’m confident that their product support comes with a high standard. Life has a way of catching up with me. Often evenings during which I planned to reply comments demand that I turn my attention elsewhere. Sadly, when that happens, comments go unanswered for weeks on end. Postmatic alleviates that problem because it encourages me to reply to a comment or two whenever I have pockets of time. It’s a lot less overwhelming than knowing I have dozens of comments waiting for me. It’s not that comment replies are a chore. They aren’t! Comments are lovely and let me know that I’m not shouting into black holes of the Internet. It’s just that writing thoughtful comments takes time and having the tools at the tips of my fingers wherever I go makes it a little easier for me. Another feature of Postmatic is email subscription to blog posts. That wasn’t the reason I installed the plugin but had a happy side effect — it helped me overcome challengess I had with integrating RSS feeds and email subscriptions. My photos are wider than 600px. They have to be in order to fill the one-column layout I use on my blog. That threw off the email formatting when pulling content from RSS feeds because the photos were too large. I tried plugins to solve the issue but they crashed my blog. I had to access my FTP server to restore it. For bloggers without at least basic coding and web hosting knowledge, that would have been a nightmare. The good thing with Postmatic is that images are responsive, so no matter which email clients readers use, emails look clean and streamlined. At its core, Postmatic is about building communication channels through comments. When you receive a blog post powered by Postmatic via email, you can reply directly in order to comment. There’s no need to visit the blog to have your voice heard. This is great for busy people or people on the go who have limited data plans. Currently the option for email comment replies means receiving all replies specific to the blog post. To prevent inboxes from overflowing, replies are collated after several comments have already been made. On the whole, I think it’s cool because this opens up the conversation and encourages readers to reply to each other’s comments on top of the blogger’s post. However, there are posts where I have no interest in hearing from everyone. This particularly applies to memes such as Top Ten Tuesday or Waiting on Wednesday. I don’t need my inbox to overflow with comments from people squealing about the same books over and over again. Some readers love reading book reviews, while others skip right over them. Some bloggers write fantastic discussion posts but I might not be interested in the same genres of books. Some bloggers have great tutorials and other bloggers have fascinating interests that they share about. Being able to subscribe to specific post categories would increase the quality of content that I care about in my email inbox. The main reason I subscribe to RSS feeds over email updates is that I can subscribe to the category feeds. This saves me time on scanning titles for posts that grab my attention. On the flip side, this adds another step of visiting the blogs to comment. When I’m on the go, I think it’s much more convenient to comment via email. For all the reasons I outlined above, I definitely recommend Postmatic. WordPress users can install the free version or take the plunge and go premium. 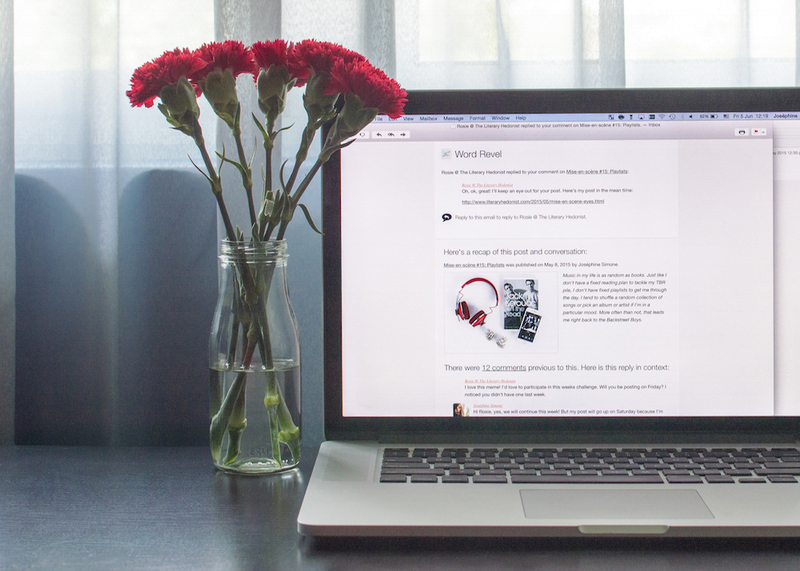 How do you feel about integrating blog comments with emails? Note: I did not receive any form of compensation to blog about Postmatic. I am sharing my thoughts with you because I think it’s a fantastic way for bloggers and readers to stay connected. This is the first time I’ve heard of this program but it sounds really interesting. I don’t have any issues with Comment Reply so far (that I know of anyway!) but I’ll keep this in mind in case it does give trouble in the future. I do agree that a system for sending comment replies is really worthwhile as most of us never have the time to go back and check for an answer and it is nice to know when a blogger relies to you. I think the trouble with Comment Reply arises when you’re using your own domain for emails rather than Gmail or Yahoo. Spam filters are on higher alert and sometimes reject emails altogether. I suspect that’s what happened in my case. Postmatic is free! The paid plan is even cooler but the free plan will give you everything jetpack does plus reply functionality. Like Jason said, there’re the free and premium versions. Lillian uses the free version on her blog. You can ask her how it’s been working out for her :) If you wanna download the free plugin, it’s available in the WordPress Plugin Directory. Thanks for the great recommendation! We appreciate all of the help and feedback you gave us during beta. Both of your wishes are on our list. My hunch is that category-specific subscriptions will be coming sooner than subscriptions to just direct replies. We have plans to offer up both eventually though. Your sites are looking wonderful. We’re so very happy to be on them. Hi Jason! Gladly :) I think it’s wonderful you guys came together to make this happen! And I look forward to the additional features I’ve been hoping for. It’s good to know that they indeed are in the works.